Nelson Wolff, Bexar County judge and former San Antonio mayor, has been an active participant in the city's political and business community for five decades. His first book, Transforming San Antonio, highlighted four major initiatives that created the economic revitalization of the Southwest's most vibrant city: building the AT&T Center; expanding the River Walk north to the Pearl Brewery; securing the Toyota manufacturing plant; and building the JW Marriott San Antonio Hill Country Resort and two adjacent PGA golf courses. The Changing Face of San Antonio explores six transformative city and countywide efforts that have emerged in the past decade: the Mission Reach expansion of the iconic River Walk, an eight-mile extension of one of the city's most valued resources; the renovation of the San Antonio Municipal Auditorium into the Tobin Center for the Performing Arts; the much-needed expansion of the University Health System; criminal justice reform; the city's efforts to become a tech leader in biomedicine, aerospace, and cybersecurity; and the creation of BiblioTech, the country's first all-digital public library. Wolff offers an insider's view of the key issues that shaped these efforts. 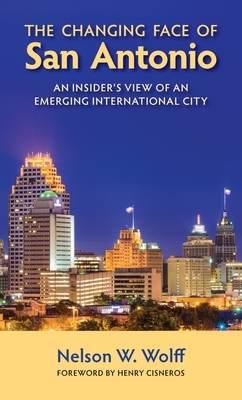 With journalistic ease, Wolff uses his unique point of view to convey the complexity of each endeavor--who said what to whom, when, and how--at a lively pace.The Changing Face of San Antonio reflects his passion for San Antonio and, as one might expect, his confidence in the paths taken under his leadership to help the city achieve its goals. The mayor of San Antonio from 1991 to 1995, Nelson W. Wolff enacted several major economic developments for the city. He is the author of Mayor: An Inside View of San Antonio Politics, 1981-1995, Baseball for Real Men: Seven Spiritual Laws for Senior Players, and Transforming San Antonio, published by Trinity University Press. He serves as Bexar County judge.